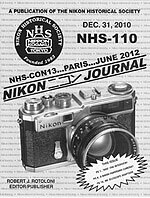 The December 2010 issue of the Nikon Journal is in member's hands. By joining the NHS you will receive the journal four times a year. We have some interesting articles this issue starting with a landmark interview with the man who "discovered" the Nikkor lenses and made the West aware of them. Chris Sap and Thieriy Ravassod traveled to his home in Southern France to spend a delightful day with DDD. See page one for the whole story. On page 6 we have a second installment by Ian DC Shephard on the array of underwater housings made for the Nikon system over the years. It is amazing how many there have been. Biagio Guerra has been working on an article about a special panorama modified Nikon F for some months. On page 8 you can finally see the results. The "Panorama l x3" custom panorama camera is discussed in detail along with photos by the designer and builder, Thomas Roma, and member Carlo Rivolti who is the proud owner of one of only 31 examples ever made! Not only a rare camera, but a fascinating and beautifully made modification of the venerable Nikon F.
Mike Symons and Uli Koch have collaborated on an article about a rare and rather esoteric rangefinder accessory. How many of you have seen the telescope adapter for the RF cameras? Better yet, have you ever seen one for the Leica SM cameras? I wish I would have had this information when doing my book. This accessory is not covered there. See page 14 for all you need to know. A lot of book updates this issue, along with photos this time of some really interesting new material, including an item not in the book at all. See page 17. There is a new book just released and, although it is not about Nikons, it is done by one of our members and it is a fascinating item. Lam Netopil of Gemany is best known as one of the leading Leica dealers in the world. 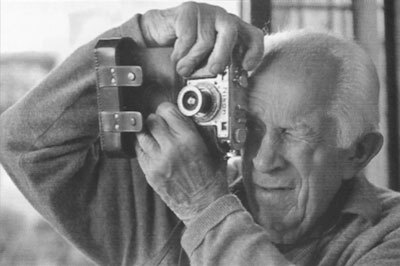 He has just published a beautiful 487 page book on "The Prototype Leicas." This all-color book has hundreds of photos of one-of-a-kind prototypes from the I.eica factory museum, as well as private collections from around the world. The photos are just gorgeous and well reproduced on fine paper in this "printed in Germany" volume. It comes with a dust jacket and a sturdy slipcover. You can contact Lars directly at www.lars‑netopil.com or lars‑netopi@lars‑netopil.com.